When it comes to digital distribution, no word gets thrown around more than Steam in the realm of PC games. 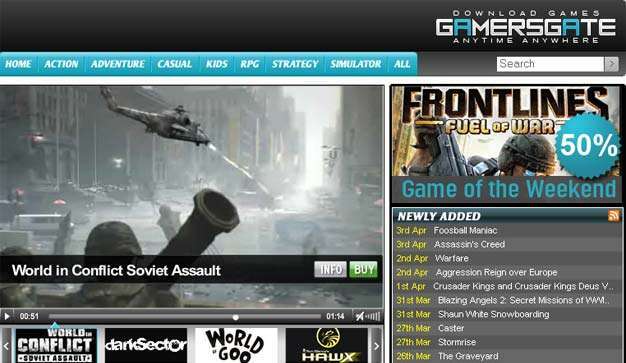 Essentially, Valve has created the top dog online download shop for getting games. It’s the Wal-Mart of online videogame retailers. Of course, they earned it. The platform is great and downloading games is about the simplest and coolest thing ever. Not having to deal with crabby cashiers alone makes it a valuable thing. That said, it certainly wouldn’t be so great if Steam were the only service offering us quality titles at the convenience of a few mouse clicks. That’s where competitors roll in vieing for a piece of that downloadable retail pie, like Direct2Drive, Good Old Games, even Games for Windows Live and Amazon at some point. This last week, I had the chance to experience one of the more premier competitors: GamersGate. Based out of Sweden, a small team has put together a pretty compelling little service that I think would be appealing to quite a few people, though their avoiding a stand alone client seems to deprive users of some of Steam’s nicer amenities. There’s a growing library, and the one already there is none too shabby. They currently have over 900 titles, and claim to have 2000 by the end of the year. Their aim is to have a large back catalog of games while still keeping up with the triple A’s. From just skimming their library on your own, you’ll actually see a surprisingly recent catalog of games that leans more toward the strategy and role-playing genres, and then next up a healthy split between action and casual. Whether they’re going to try and cut in on Good Old Games’s territory a little more is yet to be seen, but they do have the classic Thief: The Dark Project for old-fashioned stealth fun. You’ll also find some of the more critically acclaimed titles like Far Cry 2, or Fallout 3 among a good choice of the mainstream as well, with Tomb Raider: Underworld jumping out at me. The sea of strategy games is also noteworthy, with Civilization IV, Hearts of Iron, and Command & Conquer: Red Alert 3. If you’re looking for day-of-release new titles, though, you may be a bit disappointed. While Medieval 2: Total War is here, you won’t find the most recent Empire: Total War. Likewise, while Dawn of War is there, its brand new sequel is not. It’s likely that these games will show up on GamersGate eventually, but the fact remains that the consumer will not always find the newest games at release here. Digital-only games, like Braid, though, are well up to speed with official release dates. Hopefully their library of the triple A’s will catch up in speed of release. Since GamersGate doesn’t wish to lock users into using specific clients to utilize their services, they are all accessible through the official site. It’s difficult to say anything conclusive, as they are planning to revamp the entire site with a new design and interface within a month. Currently, though, everything is pretty easy to reach. The genres are listed at the top, the search bar is in the top right and works pretty competently, and each game’s profile page has a brief description of the game, a user score review section and average score, as well as a gamerankings.com score. That they didn’t go with the more ubiquitous metacritic is a little odd, but not a huge deal. Just about everything you’d need to know is there, right down to system requirements. When you actually purchase a game, you are then offered a download link, and that link will actually download a small 65K executable that will immediately begin downloading the game. Next to your download link will be, if needed, a serial key, which you enter when prompted for it, which is generally well after installation. The download speeds were excellent. On a fiber optic connection, the download stayed at a steady 1.1MB per second from start to finish. After the download, the installation screen immediately comes up, and the user will begin to install the game like they would from an optical disc. It’s all very easy, and the game will be up and running like you’d expect it to, client free. Also convenient, the little executable will ask if you want all the local content it just downloaded to be deleted, which is a nice touch. BUT, this is also a point where Steam has a clear advantage. In the Steam client, clicking to download is all it takes. Once that progress bar reaches 100%, there is no additional install process. The game is on the hard drive and ready to play. While not essential, it would be nice if the team at GamersGate found a way of doing something similar. The immediate accessibility is one of the most appealing things about digitally downloading a game. Another issue has to do with serial keys. Like the competitors, GamersGate advertises that once purchased, a game can be downloaded and installed as many times as desired. There is one exception to this that is pretty glaring, though. If a game has an install cap, where one can only install a game with a registered serial key a maximum of five times, then GamersGate will require jumping through an extra hoop. To get around this, the user will have to email GamersGate’s support team, who will then address it as soon as they are able. While their team is likely fairly timely with the matter, it’s hard to shake the fact that this still requires waiting on the user’s part in a service where everything should be completely streamlined and much more immediate. Granted, even Steam has had a similar issue with games like BioShock, but they are working against it, and hopefully GamersGate is as well. In light of everything else, it’s simply not convenient. The third and final knock against the client-free environment of GamersGate is patches. Like having to install the game manually, patches are applied so as well. Of course, in a game like Fallout 3, there’s the Games for Windows Live client that actually checks for patches for you. But even then, it will only find them once you’re in the game, so applying it means closing and restarting. At the very least, patches are provided on the main site, which is also important since standard patches will often not work with a downloaded version of the game. Still, the Steam client shows merit by promptly and conveniently applying patches automatically. A solution to this without a client is hard to imagine, though. The bottom line is GamersGate offers games to download and play, and to that end they succeed. There is no client present to consume any system resources, and the no-nonsense nature of the site does make transactions relatively quick and easy. Though what it lacks makes it almost a middle ground between digital and retail, saving you the trouble of getting out of the house (where your videogames are) and offering decent prices and often very competitive weekend deals, but still leaving a lot to the user that’s in the retail experience, such as manual installing and patching. Steam users will indeed sorely miss those amenities, which are, at this point, hallmarks of digital distribution, and the library is a good bit larger and up to date than Gate’s. In its defense, though, it’s a lot smaller. There is a lot of room for GamersGate to grow. What’s there is certainly worthwhile, and with a new site coming that will offer a “blue points” program that has opportunities for discounts and microtransactions it looks to be even moreso. Should it address its shortcomings and maintain its growing library, it can become a very significant, accessible, and competitive force. Here’s hoping they do.